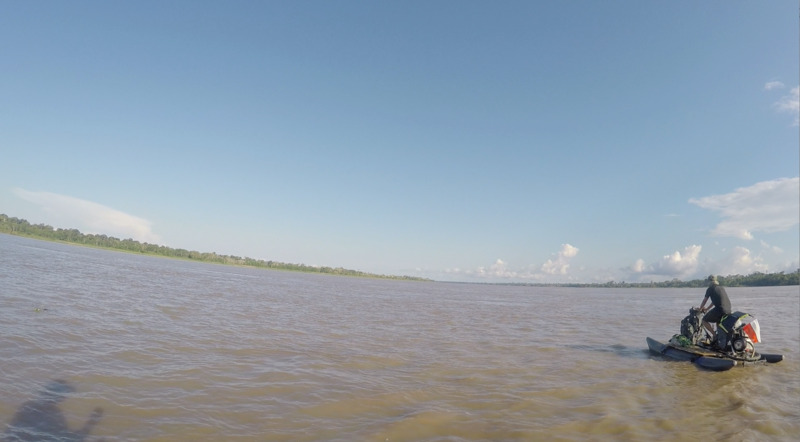 Dawid Andres stands on the deck of a boat looking into the distance, where the vast Amazon stretches to the end of the horizon. Now calm and mild, one might even say quite friendly. Not so long ago, it was churning, fuming and throwing huge waves. The anger is growing within him, mixed with a bit of resentment and doubt. He cannot believe that just several weeks ago, so ecstatic, he delivered paeans in honor of the mighty, wonderful, and beautiful queen of the rivers. Today, he does not tolerate it. No, it’s not enough – he hates Amazon! Dawid Andres stands on the deck of a boat looking into the distance, where the vast Amazon stretches to the end of the horizon. Now calm and mild, one might even say quite friendly. Not so long ago, it was churning, fuming and throwing huge waves. The anger is growing within him, mixed with a bit of resentment and doubt. He cannot believe that just several weeks ago, so ecstatic, he delivered paeans in honor of the mighty, wonderful, and beautiful queen of the rivers. Today, he does not tolerate it. No, it’s not enough – he hates Amazon! He ruminates on the long way he has already covered with Hubert. 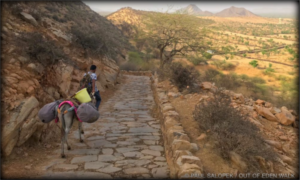 To finish their trip to the Atlantic was less than one thousand kilometers; what is that in comparison with the seven thousand, which they had already pedaled either on water or land! So much and so little, at this moment the goal was becoming more and more unattainable, at least in Dawid’s vision. Hubert Kisinski stands near and looks at his brother in silence. He can see on Dawid’s face all the feelings and thoughts that coil in the head of his brother. “I’d better leave him alone” – he recognized – “my words of comfort are futile at this time”. The crash occurred about 15 kilometers before Santarem. 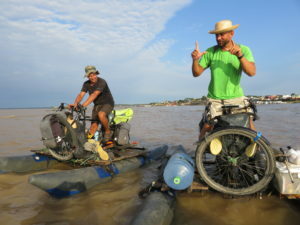 The brothers could see the outlines of the city ahead, where they planned to stop and work on strengthening the structure of their Amazonian bikes. Hubert, the “Diamond Hand”, drew designs in his head of the parts that had to be welded and added to make their vehicles stable on Amazon’s big waves. For many days, their peace of mind was disturbed by the fear of their bicycles having to withstand a challenge from the raging river. 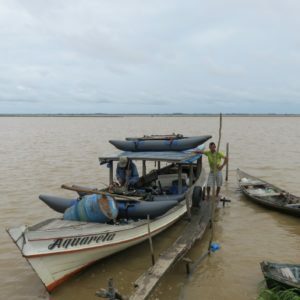 Recent ad hoc repairs made on the way from Manaus did not give such a guarantee. Relieved, they looked at the approaching shore. Just a little more effort, just a few more clicks and grinds of the bike structure, pounded by advancing momentum of the water and ……..
– I think, I have never heard Hubert cursing so much. Usually I do not mince words, not Hubert – says Dawid. Hubert’s bicycle could not withstand the pressure of the water. Key elements of its construction broke and just stopped functioning. Pedaling didn’t work, because the driving mechanism was jammed. His bicycle involuntarily succumbs to the waves, like a limp lifeboat drifting in an unknown direction, it was defeated by the element. – Until now, it was just my luck to have something broken; I was always behind. When Hubert’s bike collapsed on these unforgiving waves, I thought it was probably the end. 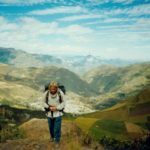 It was like a sign, a symbol of failure – Dawid describes his state of mind – It occurred to me that we couldn’t finish our trip. Actually, I came to believe that idea. By joining forces, the brothers brought their vehicles to the edge of the nearby peninsula. 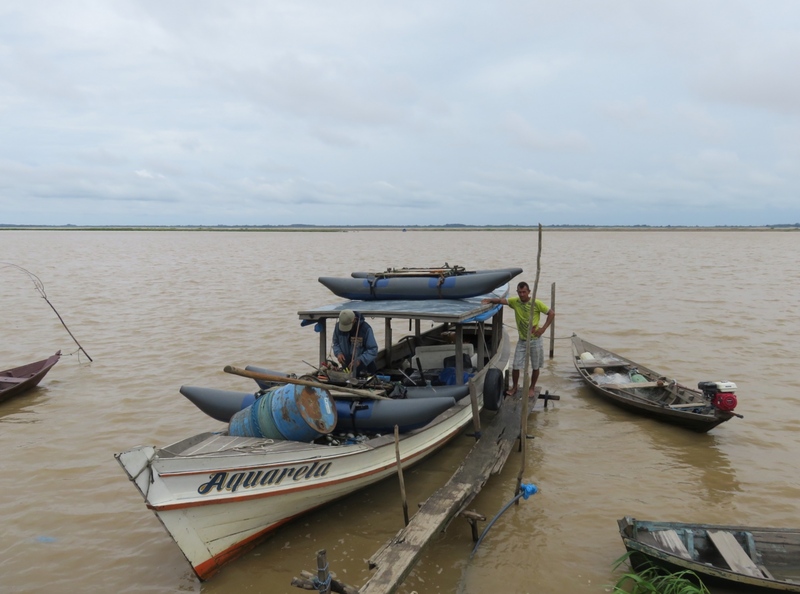 There, they found a fisherman who agreed to transport them and their equipment, one of the bikes in a sorry state, to Santarem. 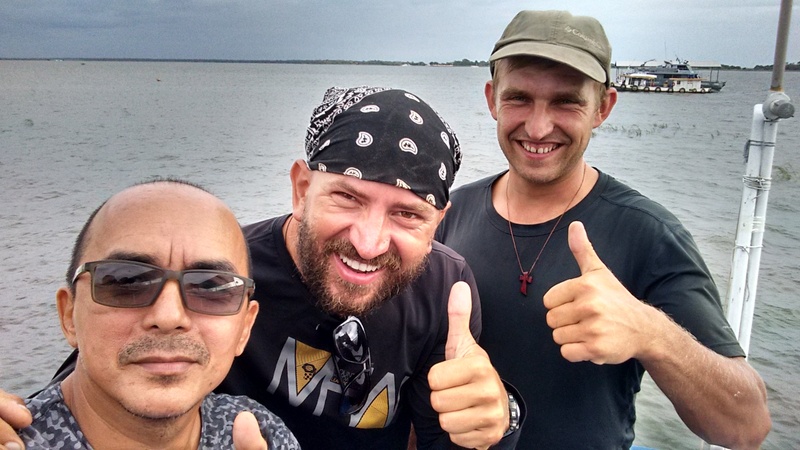 Besides the doubt in their ability to achieve the objective of the expedition, and to reach the mouth of the Amazon in the Atlantic, it was especially painful for Dawid that they could not reach Santarem on their own. A place that was at hand, so close, and it proved to be so far. Instead of biking their way to the city …. they are on the fishing boat … As he stood on the deck of that Brazilian’s boat he thought that it was not supposed to be like that. Instead of the pride, he felt humiliation, but was it fair? – Dawid, it’s not a problem – Hubert finally got the courage to speak up. 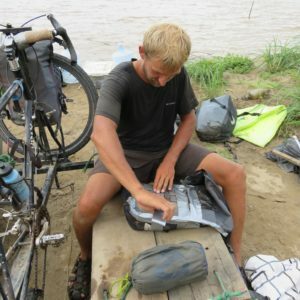 He even did not consider any other option than the continuation of the expedition – after some repairs and strengthening of bicycles we will be back at the exactly same place where I smashed my poor bike and we continue with our journey. There will not be even a centimeter break in our route. Isn’t it cool that we have such an opportunity. In the evening, the exhausted bikers finally arrived at Santarem and to the hotel, which I was able to organize thanks to the growing number of people who contact me via facebook and offer help. It is being told and written more and more about Hubert and Dawid in Brazil. 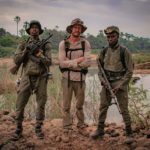 A good night’s rest seemed to be the best medicine at that point, especially for Dawid, who was experiencing a kind of crisis, a state that was quite natural at some point during such a demanding trip. On this occasion, once again, it could be seen how different each brother’s approach was to the problem, and at the same time how greatly they could complement each other. 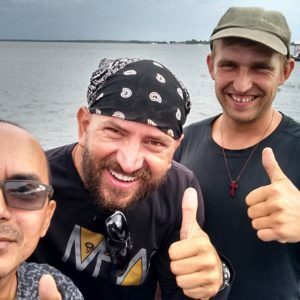 Dawid was still depressed, worried about the continuation of the expedition, and Hubert … -Oh, I’m still in a good mood – said the younger brother during our Skype conversation. He was focusing on what needed to be repaired on the bicycles and where to look for the shop, which would take care of that. Inevitably, he also drew Dawid into the planning. The next day, both brothers regained their usual joy, enthusiasm and optimism. With the help of the locals, especially Conde Castro, the work on the repair and modernization began almost immediately. And it turned out that Hubert’s bike would be able to serve a little longer. – So, what is your plan, gentlemen? – I asked, wondering what would be the brothers’ decision. It seemed that abandoning further travel absolutely did not enter the game! 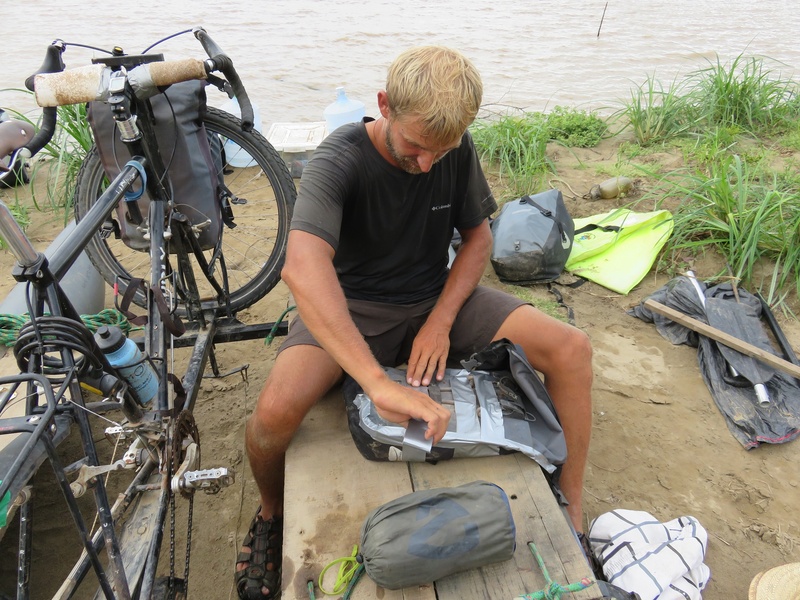 The only question that remained was whether they would travel by land – easier, or pedal on the river. The reinforcement work on both bikes had already been completed. The shop had also finished repairs of broken and jammed parts on Hubert’s bike, and all should be ready for the morning. The prospect of returning to the river, even as capricious as the Amazon, did not seem quite so impossible and worrisome any more. On the contrary, the vision of a different option than a trip on the river was frightening. – You see Piotr, Amazon is playing games with us. Now, as I look out the hotel’s window, I see the water is smooth and calm, with not even one small wavelet. And so it is not until we put bikes on the river and start to pedal that it wakes up with a furious storm as big as they come. We struggle with these waves, and the river is thrashing us badly. After a few hours of struggling, we finally reach the shore to rest, and what? The river mellows and mutes, neither waves nor wind. It happens every day – Dawid says now with a laugh. 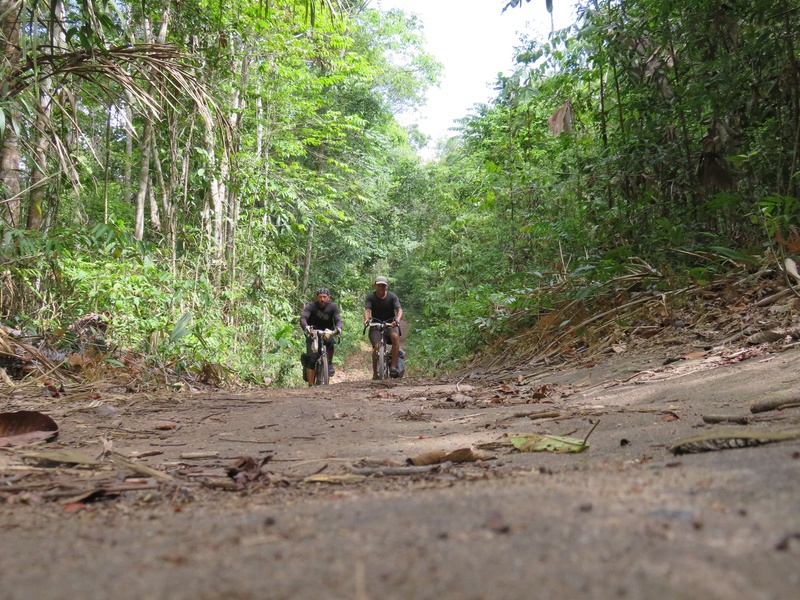 – But this is the real Amazon and I wouldn’t have forgiven myself if we ran the rest of the route overland instead. It would be our loss. After repairs and reinforcements of their Amazon bicycles, Dawid and Hubert returned to the point on the river, where strong waves had caused serious damage to the bicycle of the younger brother. 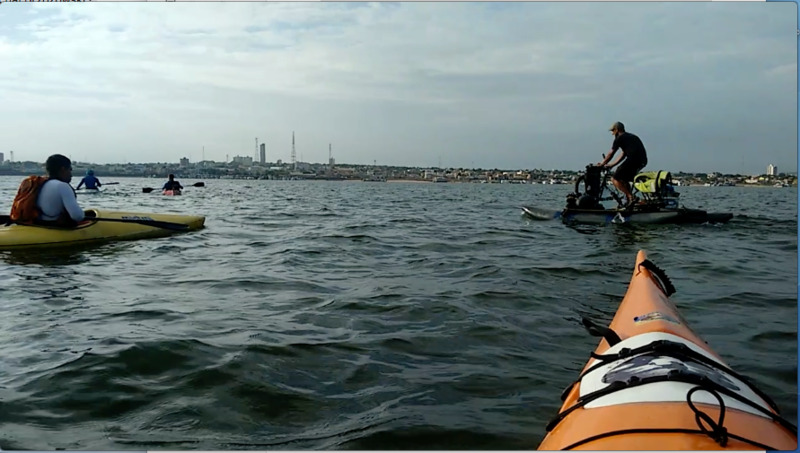 Accompanied by seven kayakers from Santarem, who decided to join them and officially say goodbye to the two friendly Poles, Dawid and Hubert headed in the direction of Belem. Reporters from a local TV station, Tapajos-Santarem, recorded that farewell event and a report was aired on the evening news. Two days later, I received a message from Dawid: “Pedaling hard. After reinforcements, the big waves are no longer scary. It is beautiful. I love this river!”.